Injectable fillers are an excellent way to turn back the hands of time without undergoing plastic surgery. Whether you are aiming to reduce folds and wrinkles or accentuate a certain facial feature, facial fillers can likely do the job. When considering facial fillers, however, you’ll quickly discover there are many different options available to you. There are a variety of brands and even different forms within a brand. How do you know which filler is right for you? A board certified skin care specialist can help you determine which facial filler you should choose. This is important. Not all fillers are created equal. Each formula is designed to achieve a certain goal within cosmetic improvement. 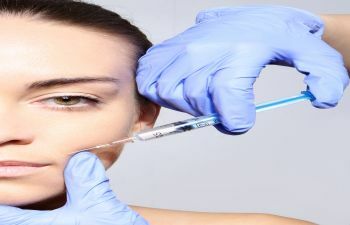 Facial fillers have different consistencies as well as unique ways they should be placed within the face. Lastly, some may last for a few months, while others can last up to 2 years! The most widely used types of fillers are injectable gels made of hyaluronic acid (HA). They all provide lasting but not permanent results. Hyaluronic acid is naturally found in our skin, and it is a building block for supple, healthy and youthful skin. The arrangement of HA molecules in a filler determines is consistency, or how soft or stiff it is. This determines whether it is best for adding volume and lifting the cheeks (stiff filler) or for addressing fine lines on the lips (soft filler). Beyond choosing the correct type of filler, the other contributing factor to your filler results is the expertise and skill of your injector. It is wise to let a dermatologist or other experienced skin care professional perform the task. Are you bothered by sagging cheeks or nasolabial folds? Do you want to enhance the appearance of your lips? These are typically an easy fix with the right facial filler and a skilled injector. At Olansky Dermatology, we are proud to offer a full menu of the latest and most proven facial fillers on the market, including those from Restylane, Juvederm, Sculptra and more. We can help you determine which filler or combination of fillers can achieve your goals best. When it comes to facial aesthetic treatments, we never use a cookie cutter approach! Call Olansky Dermatology in Atlanta today to schedule your facial filler consultation.